Kaudiyala is a small village and its located in between Rishikesh Uttarakhand - Srinagar, Badrinath highway. 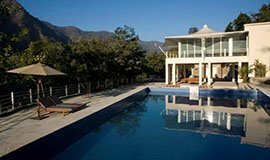 Kaudiyala in beautiful location and located 380 m high of sea level nearby Rishikesh. Kaudiyala is perfect place for White Water Rafting, one can have looks of hills with roaring sound of famous rafting rapid The Danies Dip, Three Blind Mice, THA WALL. Kaudiyala is an ideal Destination. Some small dhabas & shops, Motor Mechanic are available here. Kaudiyala White water rafting is a good sport practiced here. Kaudiyala is rafter's paradise and grade 4 + Rapid The Wall comes between Kaudiayal to Marine Drive and Shivpuri. We offer Beach/ Riverside Camp White Water River Rafting on Banks of Alaknanda River Ganga Rishikesh Uttarakhand India.Be it rafting down the river or climbing the treacherous cliffs, this adventure camp beckons the daring people. In our Kaudiyala to Rishikesh River Rafting & Camping Package, one can experience Grade 2 to Grade 4+ rapids.